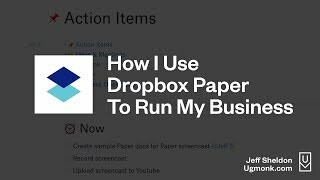 If you’ve been following me on Twitter, you know that I’m constantly raving about how much I like using Dropbox Paper. It’s so intuitive and powerful without feeling like a chore to use (like most other project management apps I’ve tried). Rather than write a lengthy review, I decided to record a quick screencast to show how I use Paper. Watch the video below or directly on Youtube here.